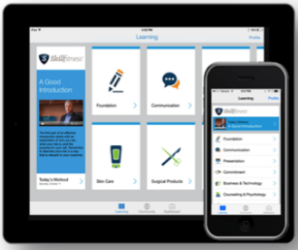 SkillFitness is a mobile, video-based skills mastery platform that transforms how teams perform at a higher level to deliver business outcomes. Here are the secrets of successful team transformation with SkillFitness. Develop the new skills needed for success. Share best practices. Practice and evaluate processes and procedures. Train and onboard new employees quickly. Cut cost and time to cross-train and up-skill. Get everyone on the same page. Verify everyone can articulate and execute key strategies and messages. Share emerging information. Track and validate competency and compliance with regulatory requirements. Mobilize teams within days, not weeks or months, with the infrastructure you already have in place. Our structured, skills mastery process makes creating and sharing content easy while ensuring engagement and effectiveness. Engage, empower and mobilize your team. Anytime, anywhere, on almost any mobile device. A better way to master skills: Engaged practice. Watch bite-sized video learning nuggets. Absorb best practices, key messages and specialized skills from in-house experts. Practice and hone skills by capturing self videos on Apple or Android smartphones or tablets. Share practice videos with peers or managers to get feedback, coaching and motivation to improve performance. Validate compliance while tracking mastery and confidence development through real-time reporting. SkillFitness helps your people rapidly master new skills by engaging them in the way they want to learn – and learn best: Through video, through feedback and coaching, on their mobile devices.